The rise of the internet, digital technologies and social media platforms have transformed the way consumers make purchasing decisions—and not just for B2C consumers, but for B2B as well. In fact, according to CEB, B2B buyers are 57% of the way through a purchasing decision before engaging with a sales rep. But, as a savvy B2B marketer, you already knew all this. So, you’ve designed an integrated strategy featuring a hearty mix of marketing tactics to help build trust and awareness as prospects do their research. You’re turning out thoughtful, relevant content that informs, engages and inspires action. You’re working with industry influencers to add credibility and authority to your efforts. Heck, you’re even driving what you believe are solid marketing qualified leads (MQLs). However, there’s a problem: The leads you’re generating in aren’t translating into sales. What’s a savvy marketer to do? You know this, too—it’s time to double-down on nurturing those MQLs. Simply put, MQLs are warm prospects who are not ready to make a purchasing decision yet—and lead nurturing can help you turn up the heat. And most of you are probably doing some form of lead nurturing already. According to DemandGen Report’s 2016 Lead Nurturing Benchmark Study, 89% of marketers use lead nurturing programs as part of their demand generation strategy. In addition, the remaining 11% said they plan to start a lead nurturing program in the next 12 months. But whether you’re seasoned at lead nurturing or just getting started, you’re likely facing some common struggles. DemandGen Report’s study also revealed that more than half of marketers ranked “developing targeted content by buyer stage/interest” as their greatest challenge. Other top challenges included adapting to modern B2B buyer expectations, changing and unpredictable buyer behavior, and processes and workflow. 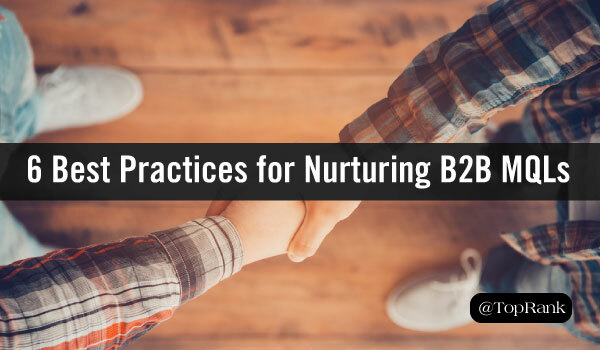 In this post, we share tips and best practices for heating up your MQL nurturing efforts, so you can build trust and relationships with prospects, and hopefully hand them off as SQLs (sales qualified leads) when the time is right. #1 – Determine what qualifies as a qualified lead. Every company has a different perspective on what MQLs and SQLs actually look like—and some may not differentiate between them at all. In addition, every lead is different and not all leads are created equal. Depending on your product or service, and your marketing mix and program goals, you’ll want to work with your marketing and sales team to define each lead type. Why is this so important? At a basic level, it makes sure that everyone is on the same page and enhances communication between the two departments. But perhaps more importantly, understanding the differences between the two helps you craft a more effective strategy—and ultimately—help you serve up higher-quality sales-ready leads. #2 – Make sure you have a deep understanding of your target customer. It’s no secret that audience and customer knowledge is the foundation of all marketing initiatives. If you want to create relevant content that nurtures them throughout their journey, you need to understand your audience’s pain points, what they care about, how they like to get information, and what influences their purchasing decisions. What are the common characteristics of my best and worst customers? What are their content preferences, search phrases, social networks, and the types of products or services they buy or “like”? What does my ideal customer look like at the top, middle and bottom of the funnel? #3 – Understand where your leads are in the sales funnel. The modern customer journey is far from linear and requires multiple touch points throughout the sales funnel. When it comes to your bucket of MQLs, while they’ve signaled their interest through some type of conversion, that doesn’t mean they’re sales-ready. As a result, you need to make an effort to map your leads to a specific area of the sales funnel if you want to nurture them properly. For example, for new leads—such as those that have just converted for the first time through a download or newsletter signup—they’re likely pretty new to your brand. As a result, the content you use to nurture may include tactical blog posts, curated third-party articles and long-form thought leadership pieces aimed at engagement. Leverage your MQL and SQL definitions, customer personas and any analytics data you have to audit your existing list of MQLs. This gives you important insights into where you stand with prospects, and can help you plan you segment your list to create nurture more effectively. When it comes to segmenting or categorizing your list, it may seem like a daunting task. If you’ve been building your list for many years, it will take a bit of work—but it’s worth it. In addition, begin incorporating and requiring segmentation information in your lead capture forms. This ensures that new audience members are categorized appropriately from the start. Read: Is Your Content Marketing Designed for the New Customer Journey? #4 – Audit your existing content for repurposing opportunities. Chances are that your team has a huge portfolio of existing content. As TopRank Marketing CEO Lee Odden often says: “Content isn’t King. It’s the Kingdom.” So why not get the most out of the kingdom you’ve built? Take an inventory of your existing content, paying special attention to the unicorns—the content that is generating the awesome traffic, engagement and helping move people to the next step. Then look for ways to repurpose and personalize the content in ways that maps to your leads at every stage of the funnel. #5 – If you’re new to lead nurturing, start small. This one’s pretty simple. If you’re just beginning to dip your toe in the lead nurturing waters, don’t dive head-first just yet. Get started by launching a single campaign such as a bi-monthly newsletter or monthly offer for all leads. By starting small, you can get something in front of your prospects right away and keep your brand top-of-mind. #6 – Invest in marketing automation software when it makes sense. Marketing automation software from vendors like Marketo and HubSpot can be an incredible lead nurturing tool. However, if your lead nurturing program is relatively young, don’t spring for marketing automation software right away. Marketing automation software is an investment that requires budget, and the appropriate resources to execute effectively. What is the organizational goal you hope to achieve with marketing automation? Do you have the resources to dedicate to the planning, implementation and measurement of a marketing automation system? Are sales and marketing aligned? At the end of the day, your marketing efforts aim to drive leads that have a high chance of turning into paying customers. But without effective lead nurturing, valuable prospects will inevitably slip through the cracks or find your competitor. Use these best practices to bolster your integrated marketing strategy, build relationships with your prospects, achieve marketing ROI and eventually deliver your sales team with better quality leads. What are your biggest lead nurturing challenges? How are you working to overcome them? Tell us in the comments section.